Our best-selling, Sport Medical Alert hypoallergenic Silicone bracelets ensures a comfortable fit without compromising either style or fashion. Know with confidence that your custom message will be attention-getting in any emergency with the use of our bold high contrast black lettering. The embossed Star of Life medical alert symbol is easily recognized world-wide advising of an existing medical condition. This bracelet is fully waterproof and designed to be cut to sizes between 5.75 and 8.5 inches. The Sport bracelet comes with our most popular stainless steel matte finish double lock security clasp which opens accordion style to easily take the bracelet on and off. The stainless steel matte finish engraving plate measures 1.8” x .78” (45mm x 20mm) and allows for 5 lines of custom engraving with each line capable of 36 characters. IMPORTANT: YOU WILL BE RECEIVING OUR ENGRAVING FORM VIA EMAIL WITHIN TWO HOURS AFTER WE RECEIVIE YOUR ORDER. All order shipped within 2 business days AFTER we receive your custom engraving information. Custom engraved in high contrast black lettering to personalize your medical message (5 lines incl.). FREE Engraving! Fully waterproof and is designed to be cut for wrist sizes 5.75 - 9.25 inches. Matte finish stainless steel engraving plate and dual safety locking clasp. Debossed medical alert Star of Life symbol recognized by medical responders. Extreme durability! 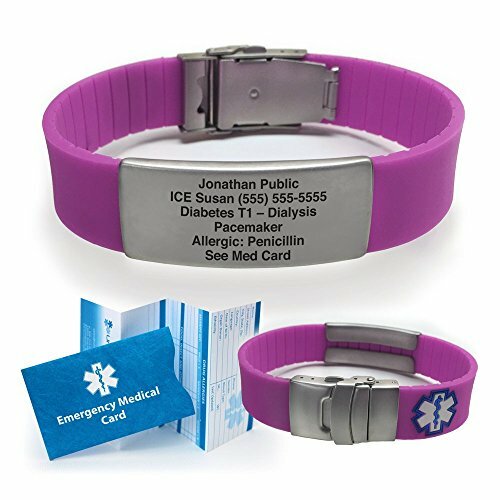 Includes Emergency Medical Card (EMC) with sleeve and optional FREE on-line registry to maintain, update and print replacements whenever you like.